In line with our quality values, we are pleased to be able to announce that we have become ‘Approved Installers’, for the Wurth ORSYmobil Van Racking range. 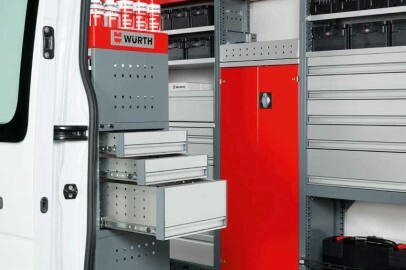 Wurth have been established as a global brand since 1945, and have been developing professional van racking products since establishing the ORSYmobil range in 1991, so we are very pleased to be able supply and install their products. Manufactured in Germany to exacting standards, this range of metal units have been fully crash tested to the latest EC standards. However, to make the crash testing relevant the system needs to be securely fitted into the van, which is why Wurth UK have trained and appointed ‘Approved Installers’. This means we are able to offer their products as fully crash tested, including the installation! The modular design means we are able to create storage solutions and a mobile work place for every individual need. This can be achieved using a combination of functional sections with moveable dividers, spacers and a variety of shelving options. 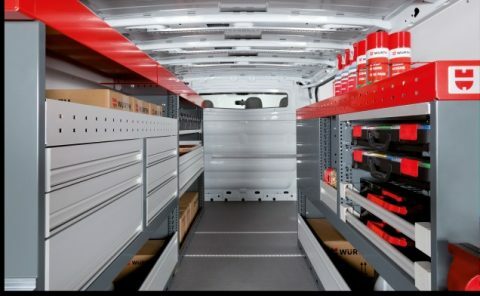 Innovative features such as internal pipe storage, small parts bins and folding vice workbenches can also be incorporated, providing everything you need for your van to work for your business. With a virtually infinite number of racking combinations available, we’ll work with you to create designs which help to make the most of the available space. We can obtain CAD design images to show you how your specific layout will look inside your van, so you can easily see if it will suit your requirements, and make changes if necessary. If you would like to know more about the Approved Installation or crash tested racking systems, please contact us and we’ll be happy to discuss your requirements.